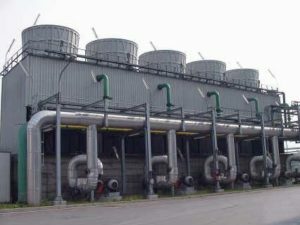 We see mainly two types of cooling water systems. There is the so called closed cooling water system, here always the same water is used and pumped around in the cooling loop. More common in the industrial use are the open cooling water systems, which will be discussed here on this page. If a cooling water system is open towards the atmosphere, it is called an open cooling water system. For the cooling purpose, there is either used always only fresh water one time through the system. This is only possible if there is ample supply of e.g. seawater, surface water from a river or bore well water. When using such water one should closely watch the COD or BOD, to have a balanced water. Or more common is using cooling towers, where the water is circulated and resued. Fresh water has to be added constantly in an open system. To replace the water, which has either evaporated or drifted by the wind from the cooling tower. Due to this evaporation of water, the concentration of the minerals in the water gets higher and higher. Therefore there has to be a regular blow down / bleed off, as a replacement of the water. As the cooling water system is open all kind of risks can come togehter with this water. using the sea or a river as a source of water, there is always the risk of higher TDS, which might cause scaling in the system. using bore well water, the risk of high amount of TDS is even higher. using city water, the TDS is normally not so high, but if the water is too soft, there is a risk of corrosion in the pipes and machines connected. all these sources of water bear the risk of microbiological contamination, which lead in first to algae growth and might over time develop to biofouling in the system. To avoid the possible risks described above, there has to be some kind of cooling water treatment. This is done in a lot of cases by using chemicals, or better a cocktail of chemicals, each of these dedicated to one problem only. The Merus Rings are a clear alternative to using chemicals. It is even possible to use Merus Rings and chemicals in the same system to optimize the amount of chemicals needed and the performance given by these. treating the cooling tower(s) only. In such a case Merus Rings are installed normally at the raisers or on the return line of the cooling water. In order to keep cooling tower free of algae. Customer choose their most critical heat exchangers, which have a high tendency of fouling. Or to protect only a pump or the cooler of a compressor. treating the entire cooling water system. When having a corrosion problem in the cooling loop or a microbiological problem with algae in the cooling tower and biofouling in the system, it is required to treat the entire cooling loop, in order to get control of the problem. Treating only part of the loop, leads with biofouling or corrosion problems, not to 100% results, as the biofouling has to be stopped in the entire system, in order to bring down the overall contamination. In addition, using Merus for the cooling water treatment, we might be able to run the system with higher TDS rates then possible otherwise. By doing like this we have proofed to our customer Merus is able the save a significant amount of water by increasing the COC, as less blow down has to be done. In case you are facing a problem in your cooling loop, please don’t hesitate to contact us, we are sure to find the right solution for Your problem as well.